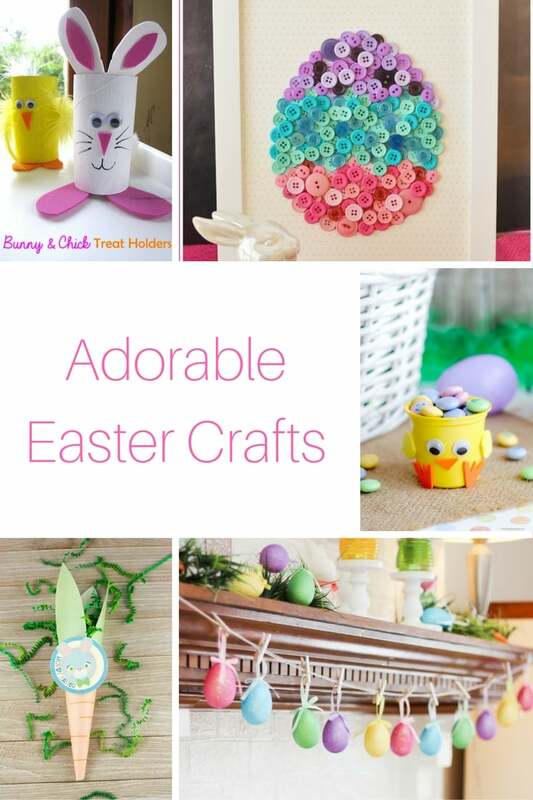 With Easter closing in on us, it is time to start thinking about making adorable Easter Crafts! So let’s look at the best bunny, Easter egg, and chick crafts for Easter! When looking at Easter crafts, I tried to pick some of the easiest crafts that are just too cute not to do. This cute little chick is made from a used K-Cup! Print out this carrot and turn it into a treat bag! The little tag that is with it is just adorable. These were a fun and easy craft for the kids to do. A little help from parents but kids get to play in fingerpaint! Make a cute centerpiece for Easter Dinner! This craft uses the iconic Peeps bunnies!! This is so easy to make and it is perfect for the mantle! Get the fingerpaint out!!! The kids will love this craft! This is just adorable. Get out your collection of buttons and create this fun Easter egg craft. Kids will love this craft! The bunnies and chicks are cute! Turn mason jars into baskets! This is an easy and cute craft to make for Easter. I would have never thought to use shaving cream, but I absolutely love these eggs! Cute Idea! I love how this craft turned out. It is super cute and easy! Use Popsicle sticks to create a fun little Easter Basket. These eggs are AWESOME! I love the Tie Dye look and they look extremely easy to make. I think the boys and I will make some like these! This beautiful wreath has fun little pom poms and makes a cute Easter wreath! Two supplies! Sign me up! The easiest wreath to create…ever! I love the wooden and egg combo. What a great way to spruce up a brown bag! This is a great way to hand out treats this Easter. There is also a free printable “Happy Easter” Tag. These jars are so fun! Paint them up any way you want to make them look like Easter Eggs! These little bunnies are too cute! Easy to make with a free printable. Planning to chop some wood for this winter? Carve off a few discs of wood and make this adorable bunny! Which one of these Easter Crafts is first on your list to make?